Announcing the Ruby Bingo Hall!! Gambling World is Proud to Present Ruby Bingo! Many visitors constantly remark how much fun it is here. So far from most of the surveys that we have conducted we have concluded that Ruby Bingo is one of the most loved Bingo Halls on the Internet! For those that like a choice, players can now choose from a 75 ball or a 90 ball version of the games to play. In addition to the many different variances in bingo, there are also slot machines, poker and scratch-off games available for your entertainment. Ruby has taken the idea of a basic bingo hall much further in development. They offer a number of different halls to choose from. Each hall has different jackpots, schedules, card prices, chat rooms and more. Having so many choices at one place gives you plenty of choices on ways to Win! The chat rooms and chat games at Ruby are pretty exciting. If you want to see who you're up against at many other places you are forced to go view profiles at a different website. But the chat software at Ruby Bingo shows you what your opponent looks like right in the chat window. All new players are automatically enrolled in Ruby Rewards. 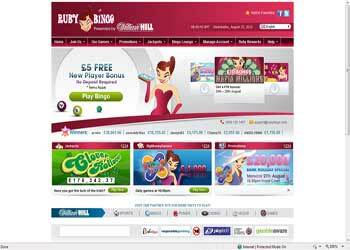 Ruby Rewards is a fabulous loyalty reward program where you earn points in the program for your game play. The reward points can later be cashed in for real dollars in your account. There are so many specials and promotions that there just wouldn't be enough room to list them all here. From Tournaments to special chat games, free bingo card specials or special deposit bonus promotions on certain days, you will never be in need for more exciting reasons to play and win. New players are also offered a very nice sign up bonus with your first deposit. When using a preferred deposit method such as Neteller or Moneybookers, you are given a 110% Bonus with your deposit up to $120. You will earn a 60% bonus on future deposits.